dulldirtydangerous: UAV Platform H: Is Human Factors Engineering up to the Task? UAV Platform H: Is Human Factors Engineering up to the Task? Platform H is a designator being given for human - unmanned military systems. As reported by C4ISR Journal (May 2009, p. 16). The next version of the Apache Longbow will give some crews the ability to control a UAV and fire its weapons. Some of the next generation (634 Block III) Longbows will include a capability for a copilot-gunner to "control a UAV, steer its sensors and order it to fire weapons." 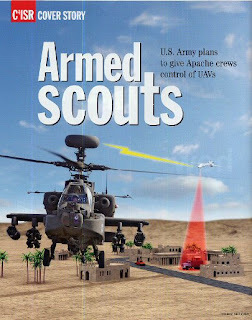 Advocates for the new design believe the new communications system that enables this -- called the Unmanned Aerial Systems Tactical Common Data Link Assembly (UTA) -- will limit Longbow exposure to ground fire and extend its targeting range to 40 km. Some Longbows in theatre in Afghanistan and Iraq already have UAV full-motion video streamed to the cockpits, but it's a one-way proposition, and targeting information is not integrated with the onboard Longbow instruments. The story's author, Keith Button, relays some doubts from other experts, but says the Army is confident of this approach. 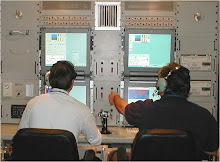 In a simulation conducted in Huntsville in the summer of 2008, crews with a UTA were able to monitor an additional target, reportedly without performance degradation. 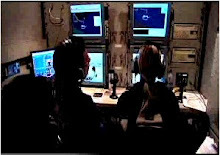 Button quotes a former F-16 pilot who believes that up to four UAV's can be controlled under routine conditions, but that live fire conditions in the heat of battle require a "one mind, one mission" focus. I confess to making up the designator "Platform H." But as this evolving technology makes clear, especially as the debate about limiting civilian casualties in so-called"drone attacks" continues to undermine political will to wage a UAS-enabled war, human factors research will be called upon for tough judgements. U.S. military research institutions have a history of strong research in human factors, but investments in that discipline may not be up the task of determining what is possible, safe and manageable with Platform H.